A Birthday requires a lot of importance, after all it comes only once a year. It is the day you came in this world. That sure has to be important, isn’t it? So it’s your dear sister’s birthday and you are going crazy searching a perfect gift for her. If you are close to your sister , you surely know how picky she is with shopping and know exactly what she is looking for since long. However, if you don’t stay with her and want to send her a gift this birthday, there are plenty of online gifting websites from where you can select variety of gifts that are just perfect for her. 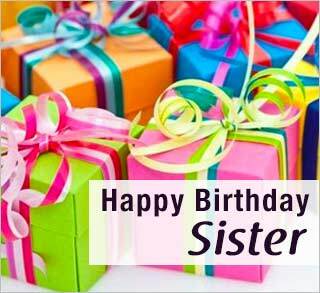 Below given are popular birthday gift ideas for sisters that are sure to help you in selecting the perfect one. A girl can never have too many clothes, cosmetics, shoes , bags etc. She will always welcome more with happiness. So try to find out which particular color bag or nail paint she has been longing to buy. Send it to her as a birthday gift and surprise her. Send her favourite perfume as a gift and she will be all smiles. Jewellery is one gift that all women treasure. So be it a fashion jewelry or pearl set depending on your sister’s age, they will surely love it and will add to their never ending collection. If your sister is married, you can always gift her a pair of diamond earings or pendants. She will definetly consider it as her best birthday gift. Personalized gifts make a special place in every girls heart. Take her picture and get it printed on a mug, pillow , clock , beam bag or a jewelry box. There are end number of options to personalize gifts and girls are very soft at hear so they will surely appreciate it. If you don’t want to give your sister just one gift, you can create a customized gift hamper. Many websites have gourmet hampers for food lovers, chocolate hampers for chocolate lovers, and cosmetic hampers too for girls who love cosmetics. So take a look at them and see which hamper your sister will love the most. Sending flowers along with a chocolate box or hamper will surely bring you brownie points in making your sister very happy on her birthday. If your sister has been waiting to buy the latest I-phone or smart phone, gift her the one she wants. If she is a music lover, ipods make a great gift too. Laptops , ipads and macbooks are very helpful for work and college. Gift them one of these if they need it. For young baby sisters, you can visit a toy store. Best option is to send a gift online and surprise the little princess sister of yours. Online stores have major brands like Barbie, Disney, Sunbaby, Tollyjoy and many more. They also keep educational gifts and hobby ideas to increase the little ones knowledge and creativity.